(The Daily Sheeple) Censorship is here. If you’ve ever wondered what it might have been like to not support the Nazi movement while living in Germany in 1942, it’s exactly what it looks like questioning the mainstream media’s “official narrative” in 2018. Have you ever seen YouTube scrub a video about the flat earth movement? No. And can you guess why? Because they don’t need to, everyone can see that all the other planets, the moon, and the sun are globes. Earth is too; why would it be the only disc in a solar system of globes? Basically, there’s no need to take down those fake videos because people know the truth and the “powers that be” don’t care if we fight about the shape of the Earth. But YouTube does remove real eyewitness accounts if it doesn’t match the mainstream media’s official narrative. And they do care a great deal about hiding the truth from viewers. Watch it while you can. In case this video gets taken down, we uploaded directly to this article. The video was in an article about the mainstream media’s desperate attempt to manipulate public opinion to gather support for gun control. This all simply censorship designed to manipulate. Anyone who simply asks a question or provides evidence that the media is not telling the truth is mocked as a “conspiracy theorist.” But the questions are still real, and the media still hasn’t provided adequate answers. Oddly enough, the “conspiracy theorists” are being proven correct on every front with regards to this story. Especially if YouTube continues to scrub videos. If there’s nothing to hide, why censor those who simply have questions? After all, its natural rights of human beings that are on the line because of this manipulation. 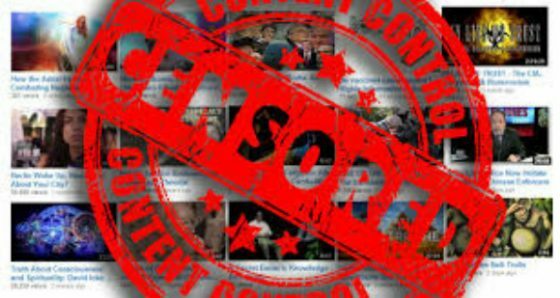 This censorship of ideas that don’t fall in line with the mainstream media and the government’s official story has been going on for a long time. It’s just becoming more clear now that the end goal is to prevent the public from using their own logic to see the truth. We are being manipulated by the media and the government. Censorship is already here.